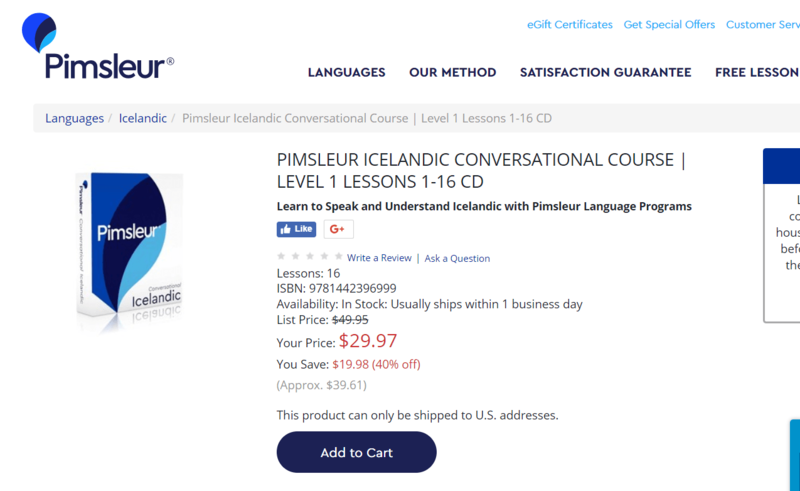 If I were younger, I might make a point of learning the Icelandic language. The vast majority of Icelanders speak the language and a tiny fraction speak English. So, to get along comfortably in the country, I would think it would pay to speak the native language. And, as you can see from the image, I could start the process for under $30. That’s a small price to pay for a modicum of comfort during a visit to the country. Which, by the way, could become more than a visit. Iceland could become a lifelong home. I haven’t extensively explored the relative ease or difficulty of immigrating to Iceland, though I gather from limited investigation that I’d have an easier time of it if I were European. The process involved in becoming European is probably not worth it, though, so I’ll just have to explore direct immigration to Iceland, without an intervening European re-homing. Of course, the idea of immigrating to Iceland without first visiting the country and getting a feel for the “lay of the land” is absurd. Except people do it every day (not necessarily involving Iceland…but, you know, immigrating to countries in which they’ve never before set foot). But I’m not quite that adventurous. Though if I were younger, I might be. In fact, if I were younger, I might be a very different person compared to the person I was when I was younger the first time around. Yes, I’d be very different. More adventurous, less afraid, more willing to take existential risks. Not existential as in pole vaulting from the top of the highest peaks in the Himalayas, but existential in terms of considering the value of abandoning a culture that, as I aged, I discovered was flawed in ways that claws holes in one’s soul. That kind of existential risk. Iceland’s population is only about 340,000. And its climate is quite interesting. The average high temperature in the hottest month, July, is 52F and the average low in the coldest month, January, is 32F. Sweater weather year-round! If I were younger, I could live my life over again. (No kidding? That’s a stunning statement if I ever made one.) I could be the risk-taker that I never was. Well, I was. In a way. I started a business that turned into a reasonably successful one, in relative terms. But that’s not the kind of risk I’m talking about. I’m talking about risks that have the potential of changing one’s life in fundamental ways. Like trekking across India or moving to France or Spain or spending time in Uzbekistan doing research on the Great Bustards, like a couchsurfer we once hosted did. Those are the kinds of things that change one’s perspectives on the world in which we live. They broaden one’s understanding of cultures and help us understand that ours, the one in which we live in isolated, insulated, self-delusional pride, is not perfect. Nor is any culture. But I digress. Earlier today the District Court of Reykjavík sentenced Lárus Welding, the former CEO of failed bank Glitnir, to five years in prison, the Icelandic National Broadcasting Service reports. Jóhannes Baldursson, the former manager of capital markets at Glitnir, received a two year sentence while Þorvaldur Lúðvík Sigurjónsson, former CEO of investment bank Saga Capital received an eighteen month sentence. These sobering realities brought home the fact that, if I were younger several years ago (I guess I was, but it’s different), I might have been caught up in the web of criminality that snared Lárus and Jóhannes and Þorvaldur. That puts an entirely different complexion on the concept of risk. What if, I wonder, I had moved to Iceland as a brash twenty-something and had been foolish enough to run with the wrong crowd? I might have found myself in an Icelandic prison. Based on a little exploration this morning, I discovered it might not be so bad. I would have been one of only about 200 inmates in one of five prisons, two of which are “open” prisons without bars and walls and perimeter fences. Maybe the others are like that, too. I’m intrigued by Icelandic prisons. I may opt to travel to Iceland and break a law just so I can be incarcerated. But I probably don’t need to do that. I learned during my exploration that the prison authorities gladly accepted a writer’s request that he be allowed to spend a couple of weeks in prison just to see what it’s like on the inside. I am beginning to LOVE Iceland! The prison management thought that was an excellent, intriguing idea. I cannot imagine the response if I asked to spend two weeks in a Federal Correctional Institution in the United States. If I were younger, I might explore the possibility of a career in prison management in Iceland. My brief foray into criminology and corrections in what was then the Texas Department of Corruption Corrections dissuaded me from pursuing a career in U.S. prisons. Perhaps, if I were younger, I might find a more appealing environment in which prisons actually helped reshape lives gone awry. Maybe. Ach, this is all regret masquerading as fantasy. Regret has no place in early-onset old age, so I’ll throw it out into the woods behind the house and let it settle on decaying logs. But I’m still intrigued by Iceland. This entry was posted in Absurdist Fantasy. Bookmark the permalink.